Hyundai and Kia car sales in China rebounded sharply in January, raising hopes that the Korean auto brands may have recovered from a two-year slump in the world’s largest automobile market. 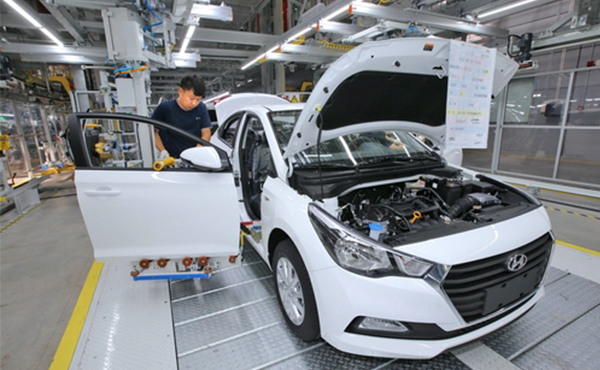 Retail sales of Korea’s top two car brands jumped 47 percent and 48 percent, respectively, from a year ago, with 110,316 units sold by Beijing Hyundai Motor Corp. in January and 45,884 units by Kia Motors. The figures were unexpected as Chinese consumers had delayed their purchase ahead of the government’s consumption incentive. However, their wholesale sales declined on a plan to downsize inventories. Hyundai’s January wholesale sales were 32,000 units across China, down 46.7 percent from a year ago, with Kia’s corresponding sales almost unchanged at 30,172 units. Meanwhile, January retail sales of Hyundai in the U.S. were up 2 percent on-year to 42,000 units, and Kia’s retail sales up 5 percent to 37,376 units. Hyundai’s wholesale sales declined 5.8 percent to 53,000 units but Kia’s wholesale sales increased 5 percent to 44,000 units. In the European retail market, Hyundai sold 36,020 units in January, down 6 percent from a year ago due to weak sales of the i30, while Kia sold 37,795 units, up 1 percent, driven by the CEED. Both brands experienced a decline in wholesale sales in Europe.